Guest Post by Jordan Viator: Submit, Share and Shout Out - Nominate Your Nonprofit Holiday Hero to Win a Free NTEN Membership! The holidays are in full swing, and in between the last minute shopping, out-of-town guests, and end-of-year nonprofit campaigns, most of us are trying to fit in as much time as possible to make a positive impact in our own way. Collaborating with leaders in the nonprofit tech community, we’ve put out heads together to find a way to come together this season and tap into the spirit of giving to give back to the amazing community of nonprofit professionals that do wonderful things all year. Working with the folks over at NTEN, we decided the nonprofit community itself should be empowered to recognize the people of their choice to win none other than a membership to the best nonprofit technology organization around, The Nonprofit Technology Network! And to show our gratitude for helping share the campaign and making sure everyone has the chance to recognize the person of their choice, each time you Tweet the contest we’re counting your submission as five. So what are you waiting for? Get your nomination and recognition on over at the Nonprofit Holiday Heroes page! And then stay tuned the first week in January when we announce winners. Jordan Viator is the Interactive Communications Manager at Convio, and manages the Connection Cafe blog, all things new and social media related and the company's corporate Web sites. 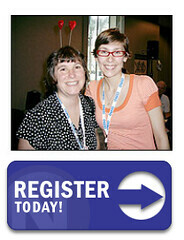 The annual Day of Service at the NTEN NTC Conference has been a tradition since 2000. A group of nonprofit techies share their time and expertise with nonprofits from the local community. I've had the pleasure of being involved, along with long time colleague Cheryl Hanback, since almost the beginning. 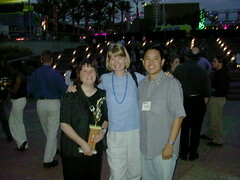 Orlando Roundup 2002 - Day of Service - We Won The Swimming UpStream Award! This year we saw a record turnout with more than 100 volunteers assisting about 60 Bay-Area organizations. In addition to the one-on-one consulting (captured by WeAreMedia Flickr BootCamp folks), a large group of nonprofit techies headed out to install two wireless networks, with equipment provided by Cisco, at the St. Anthony's Foundation and on Treasure Island. Yes, this is a great feel good event! Lots of good stories. We're not proclaiming wide ranging social impact, just giving a little back to the community. Over the years, we've reiterated this event - from office visits, types of volunteer tasks, amount of time, workshops, and lots more. One thing does seem to stay constant. Every year we have last minute cancellations, no-shows, or people who show up for the event who didn't sign up. Because we try to match volunteer skills with organizations on a one-on-one basis, sometimes a volunteer's organization does not show up or we have to assign two volunteers to work with one organizations. Because of the one-to-one matching of volunteers and 60 organizations, the logistics get unnecessarily complex -- (the incorrect table numbers were completely my fault, BTW.) Cheryl Hanback had a brilliant idea. She suggested that we set up tables organized by topic. 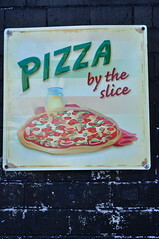 Yes, pizza by the slice! Let me explain. One story that stuck in mine came when he explained how moving to New York City from the midwest changed his perspective, because the population was big enough that you could sell pizza by the slice. So, it mean that pizzas were being created and baked before knowing who would purchase and eat them. Maybe this is will solve the problem? If you participated as a volunteer in the 09NTC Day of Service, please give us a few minutes of your time and let us know how we could improve the event going forward. Also, I set up a DOS wiki and gathered up what I could find in terms of documentation - if you have photos, videos, or other a blog post, please add. The session will share an overview of why the sequence listen, learn, and adapt is critical to implementing a successful social media strategy. We'll take a look at how to use both qualitative and hard data points to refine and adapt your strategy as well as the role of continuous listening and learning through implementation of pilots. We'll examine what can and can't be quantified as well as various metrics and analytics tools. All this will be shared through a lively mix of discussion and case studies. It was really great to have this session after Clay Shirky's keynote because we took a deeper dive on the themes that emerged. Specifically, the them of informed failure. The "Oprah" style worked really well. I wanted to get away from the expert at the front of the stage and have an informed discussion between panelists, audience, and myself. Didn't have the right Oprah set up for the mic, but it worked. My fault for not requesting it or rather waiting until the last minute to test a new delivery format. It gave me an opportunity to think about how to reteirate the content for a full-day workshop I'm doing in Chicago in June. The secret sauce to this format is not over rehearsing - get people who have in the trenches experience, ask them to prepare sound bites for the questions. I like delegating the tasks to others in the room I know - like keep timing, take notes, share knowledge. As much as possible, I tried to avoid the Q/A ask the expert - by getting audience to share what they know both in the room and the back channel. Here's the unique That's the richest. During the holidays, I was talking to Holly Ross on Twitter wondering if the bad economy would be a damper on conference attendance. Despite the tough economic times, it seems the community is really excited about the 2009 NTC. According to Holly, folks are registering at a break-neck pace, and sponsors have provided more support than ever before. That shows the community considers NTEN of great value. But I know that in trying to recruit some panelists, that not everyone is able to convince their organizations to make the investment in professional development, especially when travel and training can be easily chopped from a budget. So, I wondered outloud in a tweet whether the community could kick in some of their frequent flyer miles. And of course, Holly took that idea and put together an innovative special fundraising drive to bring more folks to the NTC: they're going to raise $10,000 for an NTC Scholarship fund by February 28. Convio is offering to match the dollars raised up to $10,000. 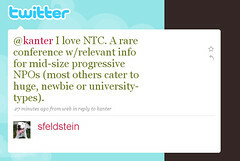 Going to NTEN's NTC in 2009? Hell Yes! One of the conferences that I've been lucky enough to attend since 2001 is the NTC and it is major source of annual inspiration and an opportunity for face time with professional colleagues. I also organize the annual Day of Service This year it is in San Francisco. I know that travel and conference attendance is viewed as a luxury and the first thing that gets slashed in hard times. But, maybe there could be some way to donate frequent flyer miles to help some folks get there who otherwise might not attend.